Jenior Turpin is a singer-songwriter from Newcastle. His critically-acclaimed debut album was released in 2012, and we filmed the launch show in Tynemouth on 8th December. 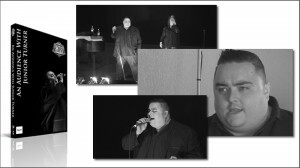 From this footage, and from an in-depth interview with Janior, we have produced his first DVD ‘An Audience with’. This will be released on 6th March with a big-screen viewing to media and selected guests. Our involvement in the project has been as follows: Live Show filmed in HD on two cameras; Live audio recorded from the mixing desk; show edited; Interview filmed in HD on two cameras; DVD edited; DVD authored; DVD Duplication; Use of our 8 foot screen and projector for the launch screening.